France retained its No. 1 ranking as the most-visited country, with 86.9 million visitors, followed by Spain (81.8 million) and the US (75.9 million), according to the United Nations World Tourism Organization. More than 1.3 billion people traveled to a foreign country in 2017, marking a 7 percent increase in international tourist arrivals from the year prior. 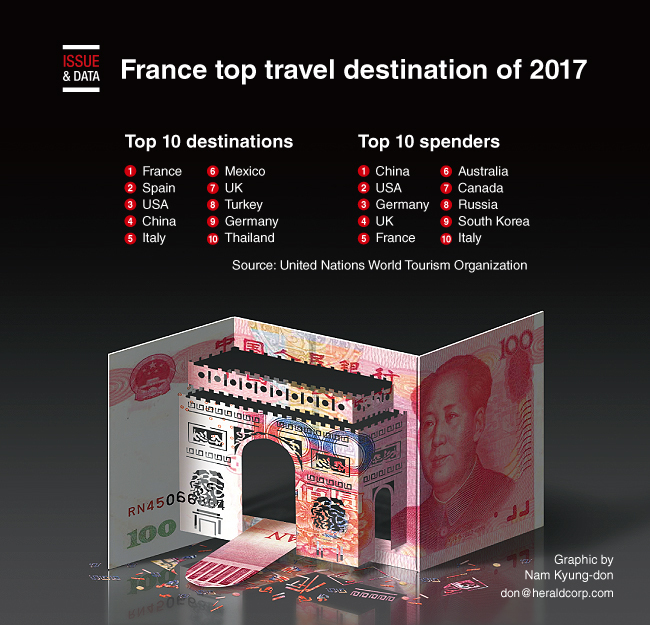 International tourists’ spending also reached $1.6 trillion in 2017, according to the UNWTO. China continued to lead outbound travel, with its tourists spending $258 billion in 2017, followed by the US, Germany and the UK. South Korean travelers were the ninth-biggest spenders in the world.